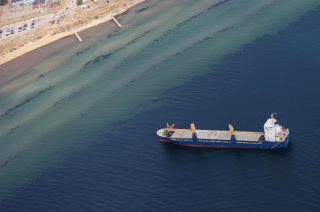 A freighter got grounded on a sandbank off the Swedish coast, just two days after the salvage operation of the stricken car carrier Makassar Highway was completed. The general cargo vessel has been identified as 2012-built BBC Lagos, registered in Antigua Barbuda. The ship ran hard aground south of Helsinborg harbor, Sweden, on August 3. Based on the data from vessel monitoring services, the ship, loaded with 5,000 tonnes of wheat, apparently started sailing in a wrong direction, heading toward the coast and eventually hitting a sandbank. The Swedish coast guard said that the ship did not respond to emergency calls when the navigational error was detected. “The coast guard has carried out a sobriety test of the master and has subsequently handed the case to the police. The master is suspected of serious seagoing and gross negligence in maritime traffic,”the coast guard informed. The police investigation into the incident and master’s suspected involvement is underway. Based on the underwater inspection of the ship’s hull, there have been no substantial damages detected. The latest update from the coast guard issued on August 5 indicates that the ship has been unloaded, without causing a fuel spill. The ship has been moved to the port of Helsinborg and the salvage operation concluded. Now that the ship has been towed to the port, the owners will further inspect the hull and decide whether the ship is in the state to continue its journey or whether it will have to be repaired.